Since my sixth book, Judgment Detox, was released in January 2018, I have heard from readers all over the world about the miracles they’ve experienced. People have healed old wounds, repaired relationships, and found a sense of peace and happiness they’d never before known! This practice will transform your life, but it does so much more than that, too. It’s not just about feeling happier and attracting more — it’s about healing the world. As I say in the book, the times we’re living in require a commitment to love. You don’t have to be a news junkie to know that division is at an all-time high. People are hurt, angry and resentful. Our work as people who walk a spiritual path is to shine a light in the darkness. When we reconnect to the power of love, we begin to vibrate at a new frequency. When you change your frequency, your family, neighbors and friends reap the benefits. One person’s energetic shift has the power to create a ripple effect across the globe. And as more and more people vibrate love, the vibrations of hate and judgment weaken. 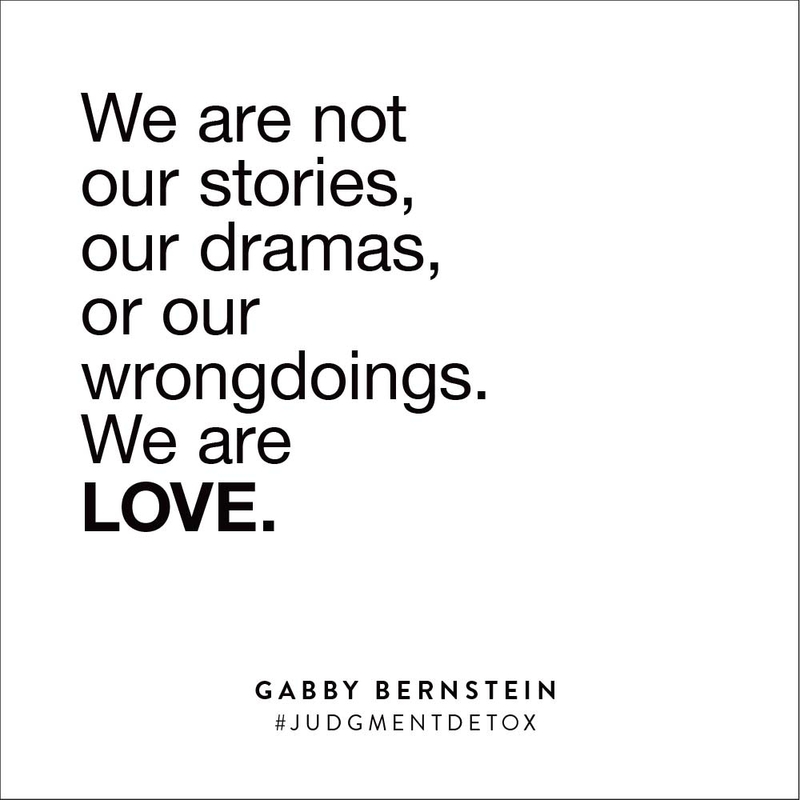 I’m proud to say that Judgment Detox is helping more people vibrate love! 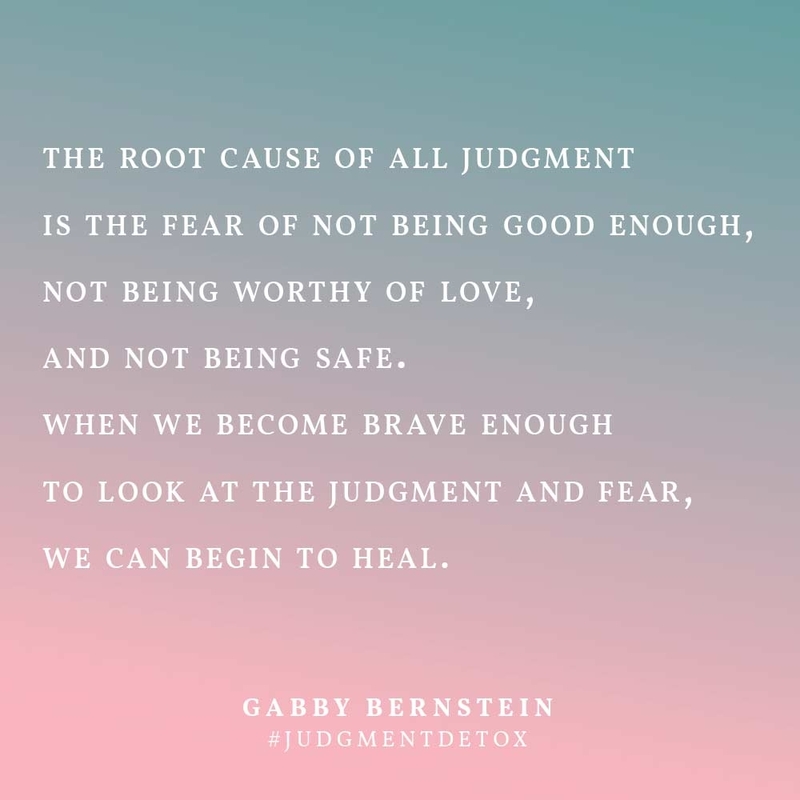 In this blog post I’ve gathered stories from Judgment Detox readers that show just how powerful this practice is. If you’ve been thinking about reading Judgment Detox, then I hope these stories inspire you to try the practice for yourself. If you’re inspired to begin the book, great news — it’s out in paperback! Order it here (and get a bonus gift!). I’ll begin with a story of my own. This is a beautiful story that I include in the book. I healed a friendship I thought I’d lost forever. When it comes to dealing with conflicts among my friends, I tend to be really good at working things out and finding solutions without hostility or tension. But my glimmering track record came to an end after I had a huge falling-out with a childhood friend, Jack. It seemed like we wouldn’t be able to fix what was broken. That a lifelong friendship now had to dissolve. After our fight, I thought of all the ways I could’ve handled the situation differently. But obsessing about the past wasn’t going to help me move forward. It was just keeping me stuck in a nightmarish cycle. 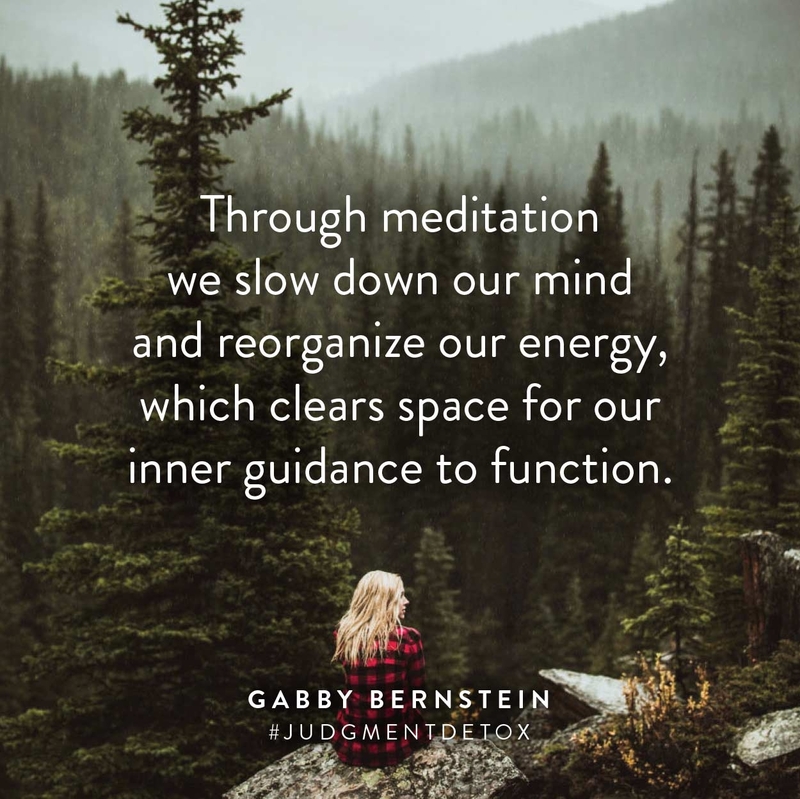 I knew I needed to bring the judgment to my meditation practice (Step 5 of the Judgment Detox) for a spiritual cleanse. I couldn’t call my friend and fix the situation over the phone, but I could clear the energy through meditation. The message felt soothing. I understood that it was time to heal the negativity between us through the energy of love. I listened to this guidance and began to send deep love to Jack through my meditation. In my mind’s eye I saw myself hugging him closely. I felt his presence in the room. I let my mind wander toward all the qualities I loved about him as I began to cry. In that moment I felt as though time and space didn’t exist. The past was dissolved and the future was nonexistent. The bond between us was restored through prayer and meditation. I felt lighter and more deeply connected to him than I ever had previously. When I felt calm I came out of my meditation. A few minutes after opening my eyes, I checked my phone to see what time it was, and I noticed a text pop up. It was from Jack! He said, “I feel like it’s time to resolve this.” I sighed with relief and thanked the Universe for this guidance. The moment I released my judgment, he felt me let go and knew it was time to heal. That is the power of meditation. Want a shortcut to miracles? Check out the Judgment Detox Mini Course! Check out the Judgment Detox Mini Course, a free 3-part mini-course that makes it really easy to follow the book! 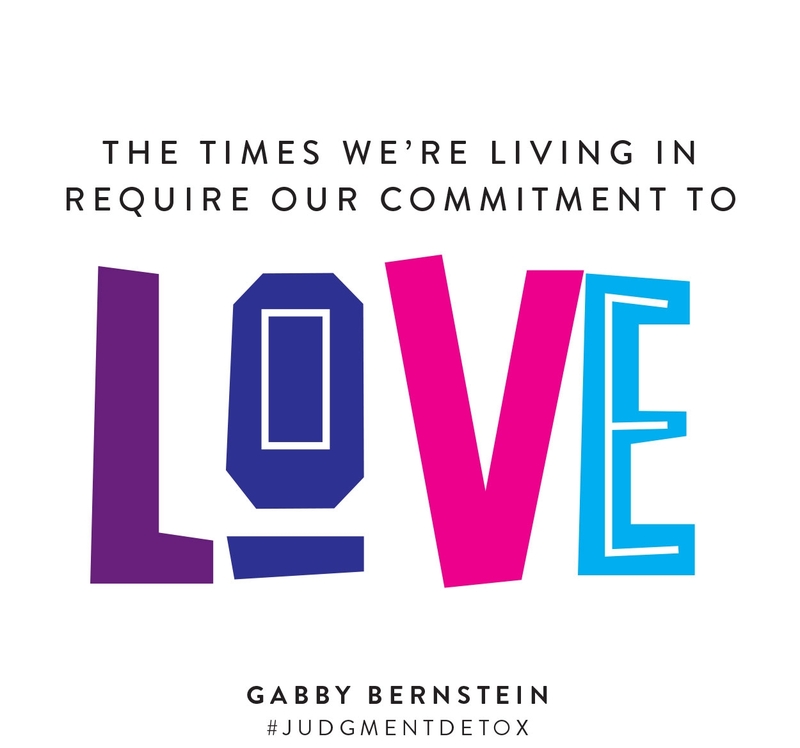 It doesn’t matter whether you’ve read Judgment Detox, you’re in the middle of it or you haven’t started it yet. You can start the Mini Course today and experience beautiful benefits. Click here to get instant access to the free Mini Course! I have always felt like I should be a better person, smarter, fitter, prettier, kinder, nicer, happier… you get the picture. I was never enough, so I spent all my thoughts looking at the faults of everyone except myself. I was a master at solving everyone else’s shitshow of a life, except my own. I have always been drawn to the self-development genre and have read so many books to help myself feel whole. They all helped in some degree. What is different about Judgment Detox is the tools that it provides you. I continually find myself picking up the book to follow along with tapping on someone who I felt judged by, or for some words of wisdom. Meditation has become a daily necessity, and I love it. Ultimately, what I have learned through the process of the Judgment Detox is that I am all I need to be. I accept myself with all my little idiosyncrasies. I even delight in them! It is still a process, but I am more aware of when my decisions are coming from fear or love. I bounce back from anger in less time and I am able to see my part in the story. I also am aware of not letting “old stories” control my thoughts. Meditation has become a daily necessity, and I love it. Strained relationships have been healed, physical pain has subsided, I have faced my shame and have learned to trust in my God. My life is more peaceful and I am not carrying around the unnecessary weight of anger, resentment and fear. Judgment Detox showed me how to look at my judgment without adding fuel to the already negative energy I was offering. I was able to be compassionate with myself by trying EFT (which was an absolutely amazing tool to add to my self-care toolbox) and honoring all my feelings. I was able to see how love was really all I ever wanted to give and receive, and how judgment was only keeping love at bay. Choosing to see the light in others instead of what I perceived as their flaws helped me see them and myself for the first time. What I loved most were the cord cutting exercises and meditations. Being willing to release the negative energy in a relationship through prayer and meditation actually saved a very important relationship. Had I not known about this tool, I’m not sure I would have addressed the relationship in such a healthy way, by focusing upon love and the highest good for all. Choosing to see the light in others instead of what I perceived as their flaws helped me see them and myself for the first time. The tools in this book are absolutely amazing. Knowing that judgment is really self-judgment allowed me to have more of an honest look at my own thinking and behavior, and giving others the benefit of the doubt when they are showing judgment toward me. Applying these practices was transformative! I have copy edited all of Gabby’s books since Spirit Junkie, and they have all moved me deeply in different ways. But working on Judgment Detox changed my life. It took me by surprise in many ways. For example, something totally unexpected happened several months after Donald Trump was elected president. I stopped being so angry. I no longer felt like our country was going to fall apart. The buzz I once caught while scrolling through vitriolic tweets or listening to political podcasts faded. This perpetual rage no longer resonated with me. So I started diversifying the news I read. I followed a lot of new people on social media. Instead of being dismissive, or assuming I knew what people really thought, I listened and asked questions. I practiced seeing people in the light. And I truly let go of the need to be right. As a result, I’ve learned a lot from all different kinds of people with different values and ideas. 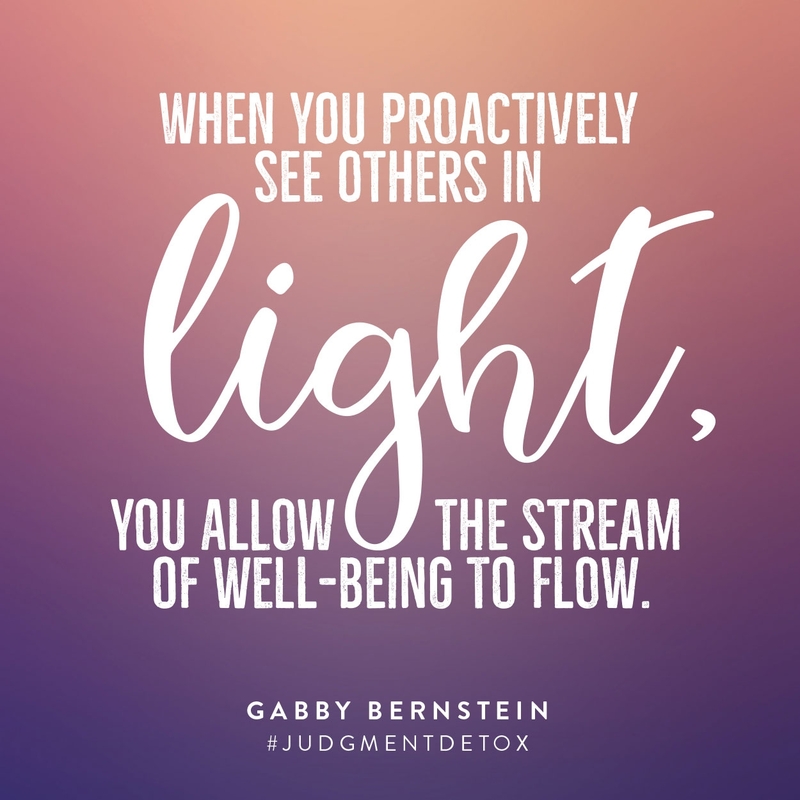 Practicing the Judgment Detox has helped me become a lot better at giving others the benefit of the doubt, finding common ground and accepting people for who they are. Now I can witness my own judgment and turn it over to the Universe with a prayer. I can stop myself in the middle of gossip or negativity change the subject to something way more productive and positive. Judgment Detox transformed me in many ways. I’m no longer convinced things are terrible. I’m not resentful and mad. Instead I am grateful and optimistic. I often hear that anger gets people into action. That might be true. But I believe that action backed by love is far more powerful and sustainable. Judgment Detox helped me see that. I love spiritual self-help books. I usually have two or three going at the same time: one in the car, one beside my bed and one in the bathroom (it is literally the only place in the house that I’m ever alone). I love listening to the language, the positivity and encouragement. I love learning something new. The only thing I don’t love is the exercises most of these books offer. I NEVER do them. I always feel like just reading the book is helpful. Yeah, I agree, doing the exercises would probably be more helpful. But a little is better than nothing, right? But not Judgment Detox. I am following this book to the letter! I hate how judging others makes me feel. I hadn’t realized just how much I judge myself. And when I really think about why I do some of the things that I do it’s because of my shame and fear. Exactly what Gabby writes about! This book immediately made things more clear. The steps are amazing! I stopped reading it for a couple weeks to work on the tapping (EFT) and I can’t believe how much it is helping me. I can’t wait to do the exercises. I love the exercises! They are making a huge difference in my life. I’m feeling better about how I treat others and I’m recognizing the destructive negative patterns toward myself! I have recommended this book to all my close friends. Working through my issues is tough. But just reading Judgment Detox and doing the exercises is helping to make that process a lot easier! I am forever grateful that this book repeatedly popped up on my Amazon recommendations. Try EFT in the Judgment Detox Mini Course! In the free Judgment Detox Mini Course, I guide you through an EFT session for immediate relief of judgment. I share other transformational tools, too, and lead you through each one so that they’re really easy to follow. Click here to get started with the free Mini Course now! 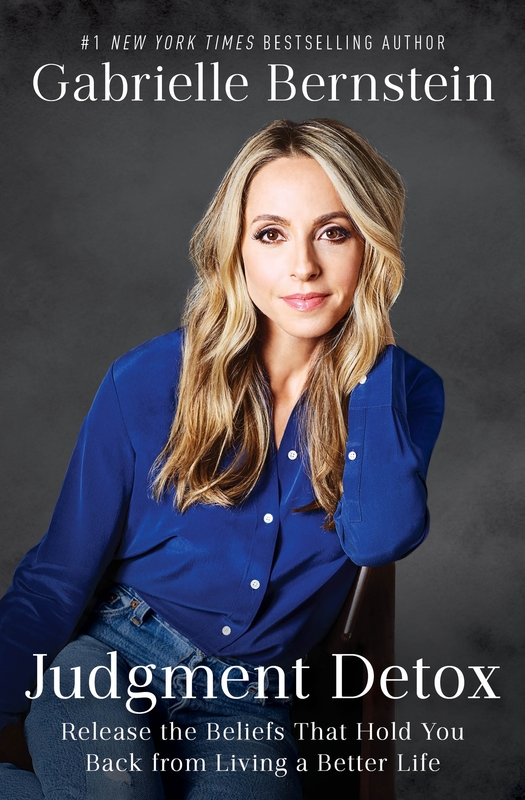 I absolutely love the Judgment Detox process and steps laid out by Gabby in her book. I used it recently when faced with some challenging family drama. I could feel my old anger, resentment and judgment so strongly… but instead of reacting, I remembered to simply feel my emotions. Instead of fanning the fires of drama and trauma in my family, I was able to choose peace and forgiveness. I witnessed my powerful negative emotions without more judgment against myself for having them, and the miracle happened when I chose peace over anger. I saw my sister, mother and father through the lens of love rather than through my own pain. I can say I’m one of those people who judges myself far more than I judge others. As a person who coaches and supports other people, it can oftentimes feel like I need to have it all together in order to contribute to others. I used to find myself judging every action, behavior or thought of mine that wasn’t perfect. Gabby’s authenticity and vulnerability in this book really allowed me to accept that I’m human and I’m always going to be dealing with my own challenges. Rather than being hard on myself about them, I can choose to see them as teaching moments. I have felt so much freedom to be myself since then. Judgment Detox was very transformational for me. It brought so much into perspective for me and helped me look at people with more compassion and see them in their childlike state. It was beautiful! [I recently started a new job] and I was doing my initial interviews with my team members to get a feel for each of them so I knew how I could help them. I was warned not to give this one girl too much business because she couldn’t really close anything. I went along with the judgment until I realized I wasn’t giving her any leads (I set appointments a sales team). Something called out to me one day when I was in my kitchen — to give this girl a chance. She needed it. It just hit me. And I realized I hadn’t given her anything and I judged her. I prayed that I could somehow help this woman. The next lead that came in happened to be in an area that she specialized in, and I gave it to her. It ended up turning into two deals for her and resulted in two bonuses for me. I’m so grateful that I trusted my inner guide. One day at the meeting she shared how those two closings (along with a couple others) gave her a huge confidence boost and she felt she could take on anything! I’m just so thrilled I was guided to this and able to help her boost her business. It’s like pouring love into the cracks of others. I’m so grateful that I trusted my inner guide, and I’m in love with letting spirit perform miracles through me. I’d been divorced from an emotionally abusive man for three years when I started the book. Because we have joint custody of our two children, it was important to me to maintain as harmonious of a relationship with him as possible for the kids. After I had finished the book, and saw all the ways I had judged him, and let the judgment go, I felt free! Like I lost 50 pounds of dead weight. Not long after that he invited me to dinner at his house with the kids. Nothing unusual — we still made the attempt to do family things from time to time. But this night after dinner, he apologized to me for a lot of the hurt he had caused in our marriage. I never in a million years expected it. I was sure he never felt remorse or guilt. He NEVER apologized to me once during our marriage. But he apologized! We talked, we laughed, we cried, and something in my chest dissolved. We talked, we laughed, we cried, and something in my chest dissolved. Something so old and painful, I didn’t even feel it anymore, until it was gone. I’d barely seen him or spoken to him between the day I had released my judgment and the night we had dinner, so I don’t think I did or said anything to trigger his apology. But I was different, my energy was different, the space of our relationship was different, and it made him different. It was a miracle! Ready to get started with Judgment Detox and experience your own miraculous shifts? Order the book and get my Super Attractor online workshop FREE! When you clear judgment and heal old wounds, you raise your energetic vibration. As a result, you attract your desires much faster. My Super Attractor online workshop will help you call in what you want and co-create the world you want to see. It’s the perfect complement to Judgment Detox — and you get lifetime access. Order the book and get your free gift now! 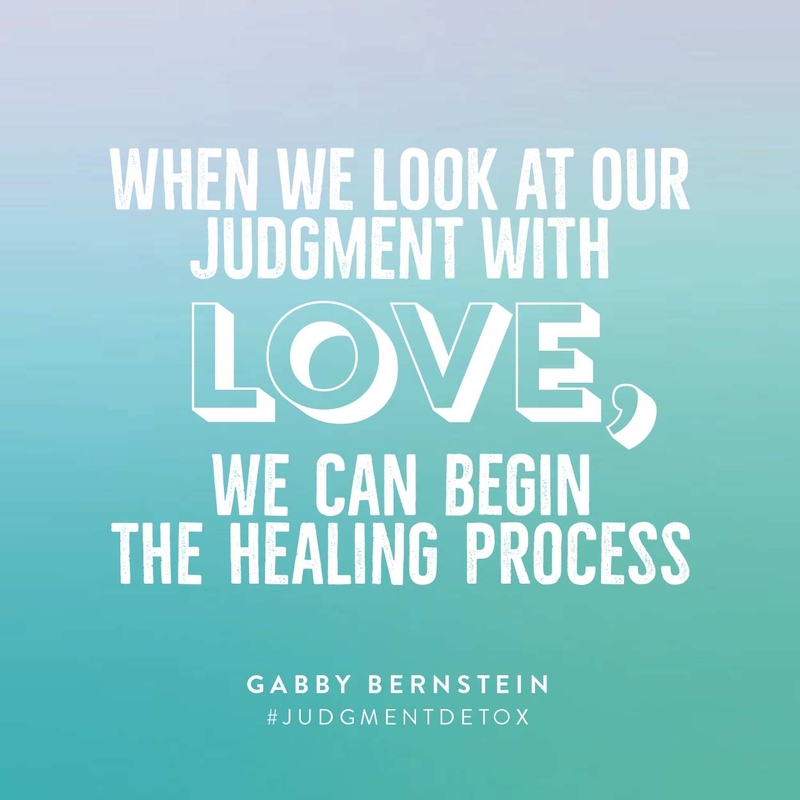 Share your Judgment Detox miracle! 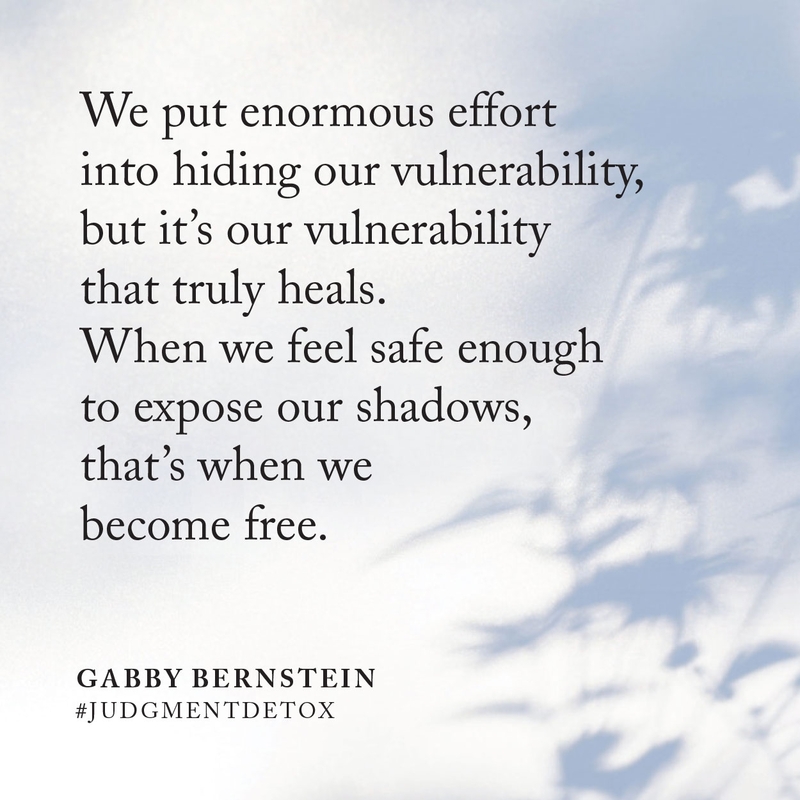 I feel so much gratitude to the many Judgment Detox readers who took the time to share their stories with my team and me. There are so many more than I could fit into one blog post. Now I want to hear from you! 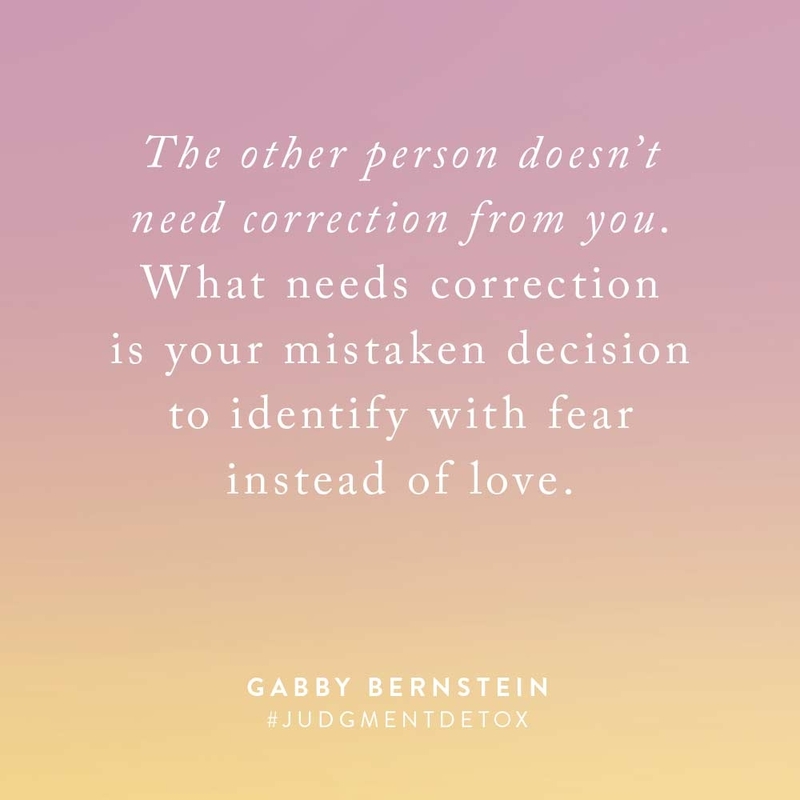 If you have your own Judgment Detox miracle to share, post it in the comments! I’ll be reading and responding to all of them. Remember there is no shift too small to share. If you have let go of one resentment, or felt relief from one meditation or prayer, that is a miracle. If you feel called to share, leave a comment below! Hi Gabby, when you were struggling to get pregnant how did you deal with your sense of feeling like a failure / feeling behind, without letting it stop you, letting it dim your light, or causing you to retreat deeper into this “failure” feeling? How do you reconcile feeling behind but still feeling worthy of eventually manifesting what you desired? I understand these feelings deeply. 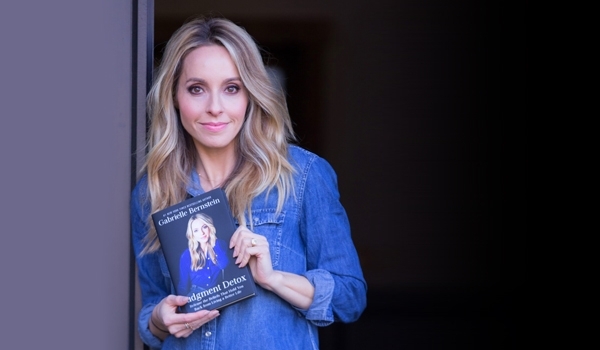 I hope this video helps you: https://gabbybernstein.com/new-blog-super-soul-sessions-talk-5-steps-spiritual-surrender/ – trusting in a bigger plan helped me make it not about me and about my babies timing. I love these blogs. They are always so uplifting! I do have a question about judgement and forgiveness. My ex-boyfriend was very manipulative and made me feel like I was an embarrassment who was unworthy of love. He had lied and manipulated me multiple times and completely broke my trust. About a year after we broke up and a year of complete self hatred that still lingers, I had my “Send him love” moment in a meditation where I was truly able to let everything go and wished him the best. Recently, we reconnected and he wants to try to be together. Now that we are trying for a romantic relationship, all of the fears I thought I had let go have come up again and they feel almost impossible to get let go of. All of the manipulation and cruel things done have resurfaced and it’s like I can’t see clearly anymore. He’s taken all the right steps to make up for what’s been done and has apologized, but I am having trouble telling what is my intuition and what is my ego. I’m having trouble connecting and keep bringing up the past. I’m not sure how to move forward and stop judging him for his past. I am just so fearful that I’ll make the same mistake twice. Thank you for being such an amazing reference point and inspiration! 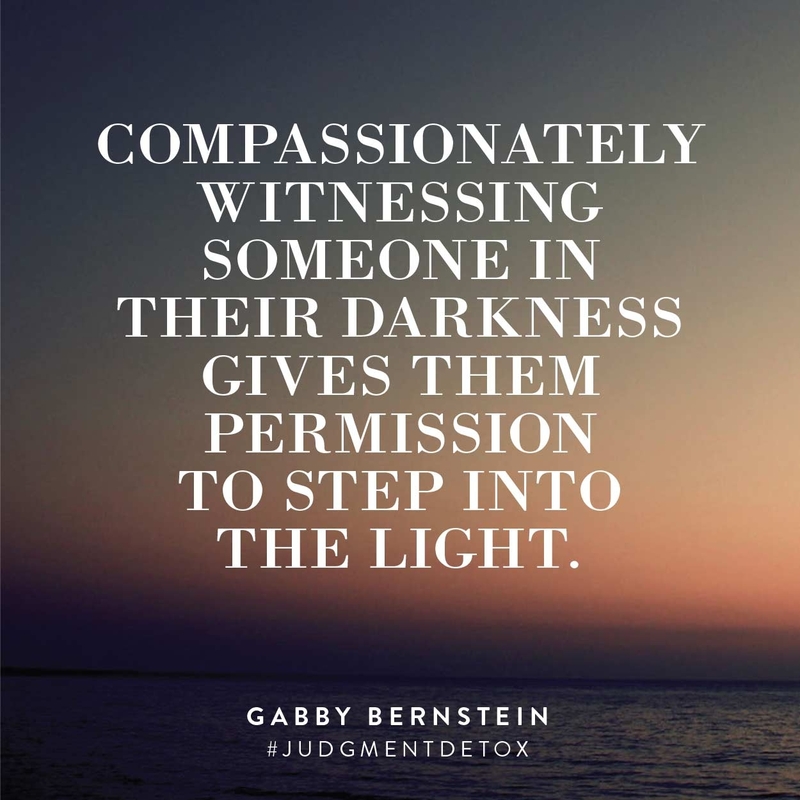 Have you practiced the Judgement Detox 6-step technique on this relationship? All of the answers are there. I just wanted to say that you truly are a beautiful soul even after everything you’ve been through … You’re light still shines brightly … Gives other people hope and freedom from the chains that once binded us . I started listening to the Judgment Detox audiobook about a week before my life hit rock bottom. I had done some work with EFT earlier this year and had amazing results, but then just sort of…forgot about it. So when I hit that low point and finally started confronting some MAJOR trauma from my past, in addition to immediately reach out to my therapist (Rick Barnett! ), I had that recent reminder of EFT and remembered how much it helped me. Three weeks later I feel like a different person (and yet more like myself than I’ve felt in years). I’m so glad I had just listened to Judgment Detox or I might not have remembered how effective EFT is for me. I’ve also let go of some major judgment and anger I was holding on to after a falling out with one of my best friends earlier this year. And after applying some of the things in Judgment Detox, there’s been a major energetic shift between the two of us. We’ve run into each other a couple of times in the last week after I actively worked to forgive her and things have been way more pleasant (compared to the open hostility we had for each other just a few weeks ago). I will tell him! He is definitely amazing! Hi Gabby, I am currently reading the universe has your back and look forward to reading judgement detox. A couple of years ago I left a good corporate career to pursue my dream of being a counsellor and truly helping people. I recently graduated from my university course and plan to start working soon. Only today I had a hearing test and the results were not great. I had surgery on one ear a few years ago but that and the other ear have deteriorated. At best I am guessing 70% of the conversations I have. So my question to you is this; how do keep pursuing my dream when my dream requires listening? Can I expect a medical miracle if I put it out there to the universe? I looked for a sign today (a gingko leaf) and it appeared to me; this gave me comfort but I am still perplexed about this issue.